From Thanksgiving to Halloween and beyond, families in Canada celebrate autumn with traditional fall foods. But these foods are more than just delicious. For families in Canada and around the world, growing these three crops helps feed their children year round and lifts them out of poverty. Beatrice loves pumpkins because they can be prepared in many ways. What would fall be without pumpkins? From spooky jack-o-lanterns to pumpkin pie, pumpkins are definitely a seasonal favourite. Pumpkins also have many benefits for farming families facing food insecurity. They are hardy crops that are more tolerant of the erratic weather caused by climate change, and are more resistant to pests and disease. They’re versatile as well. “Pumpkin leaves can be prepared as sauce (rich in vitamins), and can be sun dried and used to make flour for porridge and bread,” says Beatrice, a farmer in Uganda. 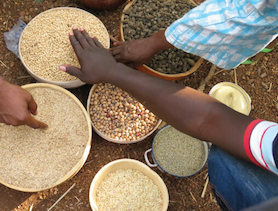 The dried flour comes in handy as a food source between harvests, when families have traditionally faced periods of hunger. Pumpkins can help them have enough to eat throughout the year. Leonia, right, peels sweet potatoes with her daughter Mary while her grandson prepares ground nuts for lunch. Sweet potatoes are another autumn favourite in Canada, and are also enjoyed around the world. 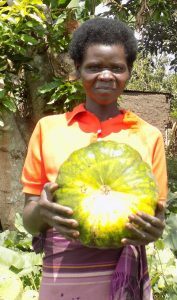 For Leonia in Uganda, growing sweet potatoes (and pumpkins) has not only boosted her income, they are also a hit with her children and grandchildren. 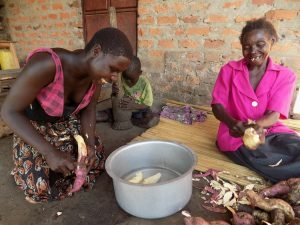 In addition to the great taste, Leonia says the added nutritional benefits of sweet potatoes has made her family healthier, and the children do not get sick as frequently. Charles has harvested nearly twice as much corn this year, thanks to farmer field school. Another fall favourite, corn (or maize) is important in different ways to many of the communities we work with. Maize is one of the Three Sisters (along with winter squash and beans) that form the basis of many Indigenous food systems across Canada. 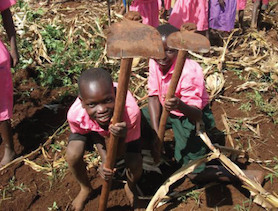 Maize is also important to families in countries like Ghana and Uganda. While some of it is eaten, most is harvested for market, providing much needed income. 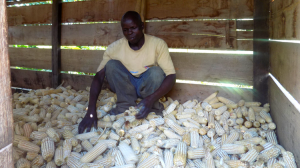 Charles in Uganda recently learned how to grow more maize, thanks to new techniques he learned in a CFTC-supported farmer field school. He now earns enough for regular family meals and to send his children to school. But he didn’t stop there. Charles has teamed up with other farmers in the community to provide extra corn for the local school’s feeding program. Growing pumpkins, sweet potatoes and corn is part of creating a sustainable food system for families in Canada and around the world. In addition to putting food on the table, they provide the stable income parents need to keep their children in school and reach their full potential. So much to love! 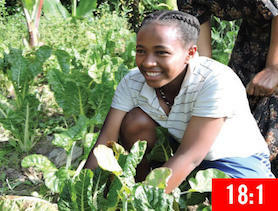 Your gift of tools for use on family farms and in community gardens gives people the ability to grow produce for extra income and better nutrition.